Bed very comfortable.Room very clean. Staff speaks English. The hotel is sparkling clean with a very quirky F1 theme. The staff are very friendly and attentive to all needs. The rooms are very well appointed. The hotel is 2 minutes from the auto route so ideal for an overnight stay. Good location on the edge of town - in a quiet industrial/commercial zone. 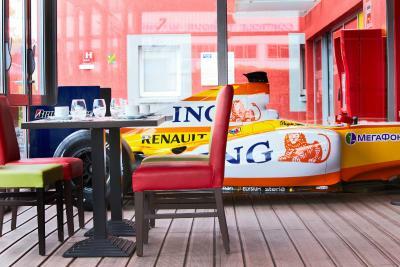 Easy to find, easy parking, motor-racing themed decor (including a Renault F-1 car in the lobby) - 5 minutes from the historic Reims-Gueux motor racing circuit. Clean, friendly, quiet and very close to the highway. Comfy beds and pillows, great layout of the rooms, so even if they're small you have a big shower and all the place you need. Comfy beds, good shower, very pleasant receptionist who let us in after hours on checking in. One of our best sellers in Reims! Located 2.5 mi from Reims SNCF and TGV Train Station, this design hotel features a red Ferrari in its lobby. 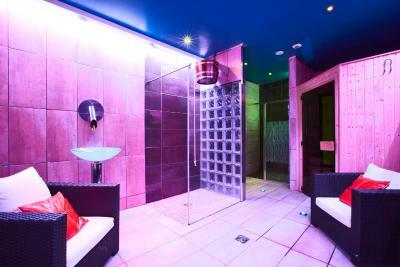 The hotel proposes a breakfast buffet, free private parking and a wellness center with a sauna and hammam. 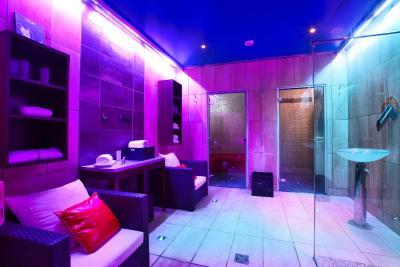 Free WiFi is available in each room with attached bathroom at Kyriad Design Enzo Reims Tinqueux. 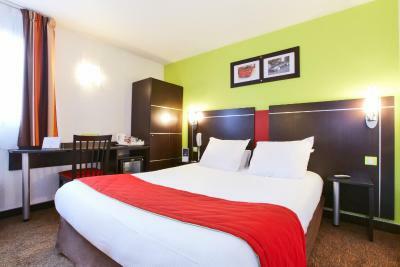 The rooms are designed with a carpet floor, green walls and mirrors, and they include a flat-screen TV. Guests can try cocktails or snacks at the bar’s terrace and receive tourist information at the reception. 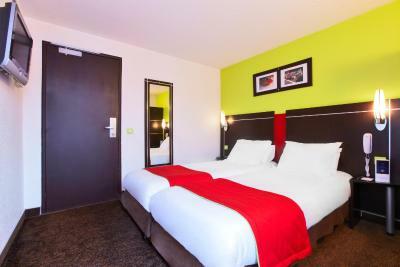 This hotel is 3.1 mi from Reims city center, including Noter-Dame cathedral and the Palais du Tau, the former residence of the Kings of France. The Champagne houses Mumm and Clicquot are 3.1 mi away. 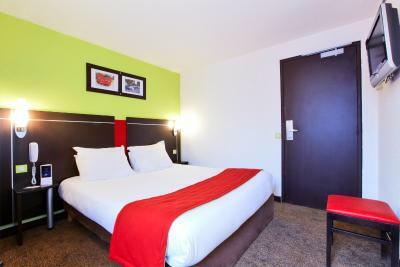 Reims Convention Center is an 8-minute drive from the hotel and the A26 motorway is 1.4 mi away. When would you like to stay at Kyriad Design Enzo Reims Tinqueux? 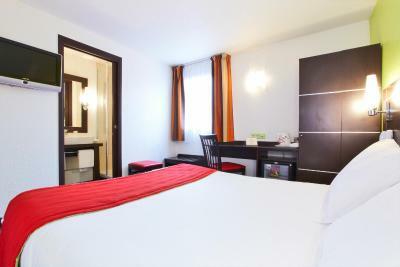 This room features free WiFi and a flat-screen TV with cable and satellite channels. It also has a desk and a private bathroom with a hairdryer. House Rules Kyriad Design Enzo Reims Tinqueux takes special requests – add in the next step! Kyriad Design Enzo Reims Tinqueux accepts these cards and reserves the right to temporarily hold an amount prior to arrival. Sunday and public holidays from 07:30 until 20:00. Room & ensuite incredibly small compared to pics. Room 111 hard to use loo/move in the ensuite shower was bigger. No evening food. Didn’t effect us but had we arrived earlier it would be good to have snacks available at least. Had to book 2 rooms as no family rooms available added to cost. close to shopping center and very friendly reception at hotel. Very poorly signposted and difficult to find in the dark. The room was quite small. The bathroom was even smaller. There was only herbal tea in the room. I had to go down to the restaurant to find English tea. The motoring memorabilia with F1 car on display. Interesting photos and posters. The staff were very friendly.